My Magic Mud Activated Charcoal Oral Rinse is a mess-free activated charcoal mouthwash flavored with gluten-free & non-gmo extracts. Optimal oral care has never been so cool. Take a swig from this awesome 420 Flask™ and Rinse Like A Rebel™ to freshen your breath and protect against cavities with the high concentration of xylitol while gently brightening teeth with activated charcoal. Infused with naturally anti-inflammatory aloe vera and turmeric to soothe your gums and mouth. Developed in Central Texas by rockstars, for rockstars. Ingredients (Mint): Reverse osmosis water, non-GMO xylitol, aloe barbadensis (organic aloe vera juice), sodium bicarbonate, organic peppermint flavor powder, organic fulvic-humic acid trace mineral complex, corcuma longa (organic turmeric extract), menthol flavor, vitamin C, nisin, natamycin, activated coconut shell charcoal. Ingredients (Cinnamon): Reverse osmosis water, non-GMO xylitol, aloe barbadensis (organic aloe vera juice), sodium bicarbonate, cinnamon clove flavor powder, organic fulvic-humic acid trace mineral complex, corcuma longa (organic turmeric extract), menthol flavor, vitamin C, nisin, natamycin, activated coconut shell charcoal. 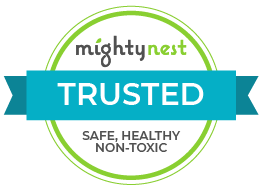 I am so excited to see mighty nest carrying this oral rinse. I purchased the mint rinse from the company in a package deal they had & loved it. Makes my mouth feel so clean & refreshed without the alcohol burning that other rinses have. I also love the non gmo ingredients they use. So excited to try the cinnamon flavor. Highly recommend. Jessica Arman, a mother of four and an avid entrepreneur, developed My Magic Mud after several months of experimentation. She wanted to create an effective whitening and deep cleaning remedy for her children that was natural and safe. Although My Magic Mud started off as a simple home remedy, it has quickly grown into a successful small business that has impacted thousands of lives.